As Blues week winds down, first we’ll take a look at the Saishinban Rockman Super Daihyakka page 37, followed by the Rockman 10 Years History Book page 65. The aloof hero who appears with a whistle! Blues’ model number is “Doctor Right Number 000.” Since Rockman is “Doctor Right Number 001”, Blues must then be a robot constructed by Dr. Right before he created Rockman. 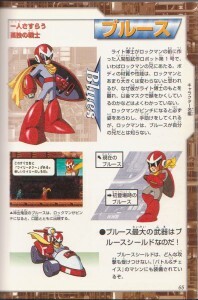 That is to say, Blues is like Rockman’s older brother (or in other words, his prototype). 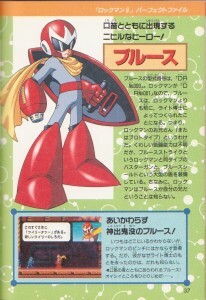 The full extent of his combat abilities are unclear, but he is known to be equipped with a buster gun of similar type to Rockman’s called the Blues Strike, and a large shield called the Blues Shield. Incidentally, Rockman is unaware of the fact that Blues is his older brother. You can always expect Blues to show up unexpectedly! Not matter the time or the place, whenever and wherever Rockman finds himself in a pinch, you can count on Blues to show up. However, as to why he left Dr. Right and went out on his own, nobody knows. Dr. Right’s first humanoid robot prototype that he created even before Rockman, who can essentially be called Rockman’s older brother. His body’s characteristics and abilities appear to be quite similar to Rockman’s, but as to exactly why he took leave of Dr. Right, and later showed up wearing a mask over his face, no one else knows. He always seems to appear to lend a hand whenever Rockman’s in trouble, but Rockman himself doesn’t know that Blues is his older brother. 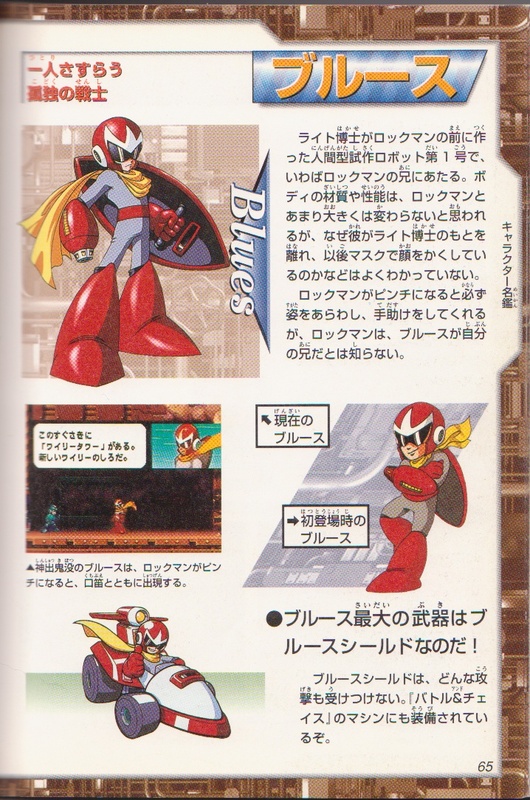 Left caption: The elusive Blues appears with a whistle whenever Rockman’s in a bind! Blues’ greatest weapon is none other than the Blues Shield! Blues Shield can repel all sorts of attacks. Even his racing machine in “Battle & Chase” has it equipped! Since Blues week is almost through, I wanted to take some time to talk about the things that these books have not. For starters, that bright yellow scarf. Where did he get it? Why does he like it so? And how does it always seem to flap in the wind, whether he’s standing still or even underwater? Inquiring minds want to know! The Breakman mask is another thing they avoid discussing a lot. If you haven’t already, you should definitely check out the Mega Man 3 Mysteries page from my affiliate The Mechanical Maniacs. Gauntlet and his friends have uncovered a great deal of interesting things by examining the Rockman 3 ROM data. I agree with his conclusion, that the Breakman form is a kind of power up for Blues, and not so much a disguise, since we already know that Wily designed Blues’ standard helmet and shades to help conceal his identity. Personally, I think the Breakman mask and name might have been an identity that Wily wanted Blues to have, but Blues chose to keep his own name instead, and perhaps only used “Breakman” as a favor to Dr. Wily on the one time when Wily needed him to stall while he was sneaking away with Gamma. Blues may have felt he owed Dr. Wily that much for saving his life. Last but not least, that whistle. What is that tune? His own composition, or something else? Your homework is to post your thoughts and theories to these unanswered questions in the comments section! 6 Comments to "Give a Little Whistle"
Scarf: I heard that it was part of the disguise Wily gave him; he probably keeps it around simply because he likes it. There’s another Proto oddity. Namely that shield. He never actually uses it in Megaman 3, despite it being prominent on the sprite. Even when he jumps it’s hardly used. Perhaps they meant it to be like Megaman 9 – that he was supposed to be shielded while jumping – but ran out of time before it was implemented. I also find it strange that he constantly has different attack abilities. While Megaman has been relatively stable, with added abilities granted over time, Protoman’s abilities vary drastically in Power Battles / Fighters, MM PU, and MM9, and even MM7 to a degree. From how his shield mechanics work (whether it shields him while standing still, jumping, dashing, charging, or walking) to whether he dashes or slides, to PU giving him a totally different Blues Strike than any other game. Also his status as “prototype” belies his advanced skills, especially in MM9 / 10. Of course, at least there he can be said merely to have retained his skills rather than let them slack. Blues, and Forte too, have been shuffled about a lot in terms of game abilities. It seems like they really get reworked any time it is convenient. I’m sure a lot of the oddities are things we could chalk up to game mechanics quirks, or development ideas that weren’t fully fleshed out. But I find it’s a lot of fun to muse about! So thanks to you both for your insightful comments. You both get an A+! 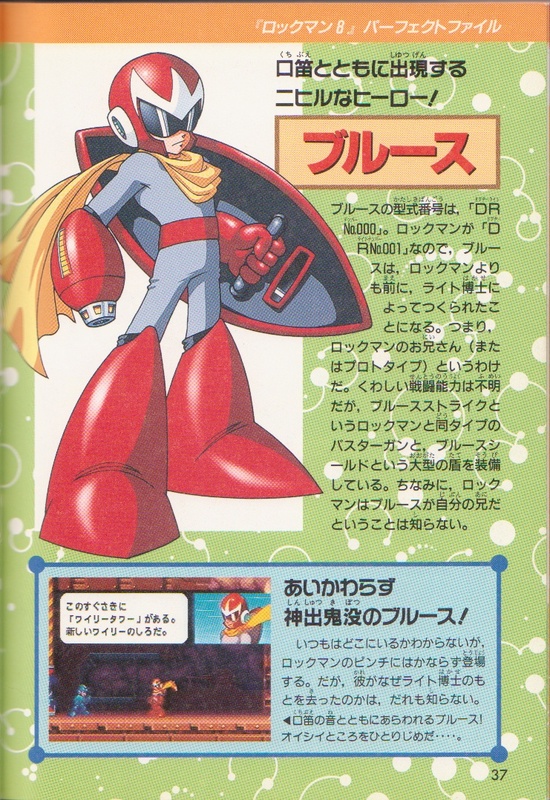 In that regard, I’ve been very interested in learning more about the Rockman3 story in Gigamix, particularly in how it matches up with the quick Rockman3 recap from back in Megamix. The quick recap has Blues telling his name right away, whereas Gigamix has the first appearence of Breakman. Kinda matching the use of names within the manual versus the game. You’ve brought up an interesting question. I do know that when it was first written, Ariga’s opening to Metal Heart was just supposed to be a recap of the game. That was years before he decided to rewrite the Rockman 3 story himself in Gigamix, so that’s probably why it doesn’t match up well. I don’t have the latest edition of Megamix that’s out in Japan now, since I have a hard time wanting to buy the same manga over and over. But he might have changed or removed that synopsis page to match with the Asteroid Blues version of the story. Or he might have just left it as is, I’m not sure. My thoughts on Break Man? Assuming he was supposed to be in that guise all the time (and perhaps even if not, with just the name), it would make sense if he was acting as the figurehead for MM3’s robot rebellion, given Wily was supposed to be “innocent” of it all. It would certainly help take some suspicion off of Wily, had that been said, at any rate.